resetting the game. Next, you start by touching the white arrow to choose your background scene giving students a choice or if you are studying a theme in another class you can connect the two. Now it’s time to play. The app contains General Knowledge, Logical Reasoning,Math and English. You are presented with 15 different circles with different pictures. The pictures range from sentences, 8,10 to a beetle or a splatter of red paint. What does this all mean? Let’s say you chose the ladybug. You would get instruction on the next slide to match the spots on the wings with a number sentence on the right side. This becomes an addition game with matching and the ability to cross the midline. It is a creative way to show students how to make an addition sentence. Another game is a picture of the sun. You are directed to match a rhyming word with sun. A more creative game is a picture of a space alien. Your goal is to match a book title with a picture. This is a great app for a Resource Room with children who need help on multiple skills. It is also nice to use when students have free time and need extra help on specific topics. You do get a score of how many the child got wrong but it would be nice to see a true data tracking program in place. It would also be nice to have the option for sound when reading the directions for non-readers. When completing a writing assignment, the student will correctly use capital letters for the beginning of each sentence, proper nouns, titles and abbreviations. The student will write :number organized sentences in a logical, sequential order. When given a :number digit number, the student will verbally identify the place value of each digit (e.g., ones, tens, hundreds). The student will verbally solve addition facts up to :number. The student will verbally solve subtraction facts up to :number. As a teacher I always wonder what is the best way to teach children measurement? It is best when it is shown visually, but we do not always have the right tools in the classroom. For $1.99 Emantras Inc has done a great job helping me and other teachers demonstrate measurement using Measurement HD. The settings in Measurement HD are just the student’s name and sound on or off. Next, there are 5 types of measurement for the student to work on. First, is the crazy clock. The student is given an analog clock. They are told they go to a different place on the hour. The child needs to set the correct time. Next, is Scale Tale. You have an adorable one eyed monster who has his hands spread. The child is asked “what is heavier a donut or a full chicken”? The items are placed in the monster’s hands he moves his hands back and forth like a scale showing the student and then it lands on the chicken. Students are learning the difference between lighter and heavier. The third game is fill me up. Children fill pitchers or water jugs to see which has more or less. Next, is shorter or longer. The student is presented with two spoons, one is shorter than the other. Finally, the last game is Action Months where students drag the letters of the month to practice spelling and the order of the months. This app helps to reinforce measurement concepts that need to be mastered in the Kindergarten Common Core Standards. Students who may have visual spatial difficulty will enjoy this app as it reinforces measurement concepts being taught. IEP Goals: When shown a clock, the student will tell time to the hour. or lessons you design on your own. The app is See.Touch. Learn Pro for $34.99. There is also a free version See.Touch. Learn. First, the object of See.Touch.Learn Pro is to have all of the flashcards you need for any subject right at your finger tip. When you open the app you have a choice of Lessons, Libraries, Community, Settings and What’s New. As always I like to go to my settings. There are lesson play controls that include how you want your flash cards to react when touched. You can have text, audio wiggle an incorrect card and more. Next, is sound customization. This is very important depending upon the child you are working with. You can have everything from no sound to Bwoop for correct, incorrect and lesson finished. Finally, if you want to import See.Touch.Learn Free you can do it in the settings. Next, the app has a built in library, that is set up alphabetically. You can search for a lesson in the search box. Once you find your lesson you go into Play Mode. The app has a computerized voice that is available for non-readers or readers can follow the directions. The flashcards take you through a series of selections depending upon the category. Upon completion of the activity you get a score of how many you got correct. You also see how many attempts it may have taken if you are incorrect. Lessons may be about vegetables. The directions will say touch the apple. Then you may have four pictures and need to touch something red. This continues through a set of about nine cards. The next stage are the libraries. You have many more choices of lessons in the libraries. These can be downloaded for free in the Pro addition. You just choose what you want and download and it will appear in your lessons. Finally, there is the community. The community is a shared network of teachers and therapists from all over the world. You just need to set up a free account to download these lessons. This app is endless. You can make your own lessons, use other lessons from all of the world and use the built in lessons. The pictures are vibrant and will keep the child’s attention. The free app has 60 lessons built in for you to try before purchasing the pro. You will not be disappointed with this app. Do you have students on a variety of reading levels? Do they each test differently? Reading Comprehension Camp by Smarty Ears For $14.99 ( the Internet says $21.99) has 50 stories on 5 different levels. Level 1 is for first and second graders. Level 5 uses the Flesch-Kincaid readability level of 6-7 grades, designed for older students. This is a great app when working with children on varying reading levels. No one needs to know the level of the student except the teacher and the parent. The other nice component of this app is the ability to have 4 students playing at once to increase socialization. The settings are quite simple. Adjust font size and image size. There is the option of having the story read for non-readers or students can read to themselves. Students can also record themselves reading to work on fluency if this is an are of concern. Upon completion of the story there are 11 types of quizzes. If you want all tap the apple that says all. What is really makes this app special is the types of questions you can choose. Questions range from Wh to Inferences, Cause and Effect and more. When you take the quiz you can hide the text or for student who are learning how to answer comprehension questions keep the text. Each question has a hint button. The hint highlights where the answer is. Upon completion of the quiz you get a detailed score of the session. It tells you the date, number of questions answered and stories completed. 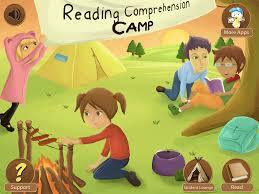 Reading Comprehension Camp is a complete app for grades 1-7. It is appropriate for students who need Response to Intervention or meet IEP goals and Common Core Standards. It is easy to use and great for a classroom with only a few iPads. IEP Goals: After listening to a story or passage selection, the student will verbally identify :number facts about the story, and recall :number relevant details about the setting, characters and events. iSequences by Fundacion Planeta Imaginario for $1.99 can be used with children on the spectrum or with developmental disabilities. The app has 3 different activities with over 100 different scenarios. When asked why sequencing is important? It is the foundation to many skills students need to able to do as they move on in their curriculum. It helps to put order into a child’s life understanding what comes first, seconds and so forth. Sequencing is done in comprehension- Teachers prompt students to place the events of a story in order using terms such as “then,” “next,” and “finally.” We do it in writing using an introduction, a plot and a conclusion. In math when placing numbers in sequential order it is necessary to show that numbers create patterns and have value. We even need to sequence in daily living skills such as following the steps to preparing for bed. 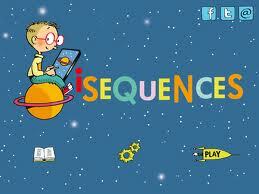 iSequences does a great job of teaching a variety of sequences. As always go to your settings. You have a few choices to make before you begin using the app. First, do you want your sequences sequential or random? Do you want to show text and or play back audio. Next, is the configuration mode. Depending on the child do you want to put in the right order? What will happen next? or Emotions? You can have all three or focus on one at a time. Finally, choose level 1 or 2 and the sequences you think the child needs to work on from daily living skills to putting something together. Now you are ready to go. I like the addition of the emotions as it helps the student validate how they should be feeling. If they feel differently it is an opportunity for discussion. In some scenes students are asked what happens next? This opens the door to abstract thought which may be difficult for some students but may be a goal that the teacher is working on. This platform is not threatening and using pictures helps the student sort the answer out visually. I would love to seeing data tracking based on the 3 different criteria as they are so important in the learning process. It would help teachers have another vantage point on how to help their students be successful. Right now this is a good app that will help teacher determine where there students may be struggling. It can be used in a group format having an assistant keep track of student responses. The student will sequence objects, pictures and letters by identifying first, middle and last. The student will predict what will happen next in a sequence of events by verbally responding or arranging a sequence of pictures (e.g., “What will happen if I do this?”). Kids Learning-Photo Touch Concepts by Grasshopper Apps for $.99 is a must have app for students who have difficulty with spatial relations, time, opposities and animals. First, go into your settings and choose the concepts the child needs to work on. There are over 1000 concepts to choose from within the main categories. If you want to display a hint turn that on in the settings. You can also customize your error and success sounds or have no sound for those children who are noise sensitive. The app is appropriate for ages 4-8 depending on the child. I use this app in my class working with students who have developmental disabilities as they have difficulty with opposites and spatial relations. The pictures are real and the voice is a non- computerized voice making it a very user friendly app. I would love to be able to track student data as this is a significant area of difficulty. It would give me an understanding how my students are doing. In the meantime either I check off the answers that the child gets wrong or an assistant helps. One of the areas many of the student struggle with is which arrow is pointing right? It does allow me to create a lesson on right vs. left when a concept is not mastered. Students like to use this app when asked what app they want to use during a break. IEP Goal: The student will identify and use :number readiness level vocabulary words related to position(e.g., next, middle, around). The student will identify and use :number readiness level vocabulary words related to amount (e.g. more, less, few).